Viva Miami! is a day of mock auditions and a workshop for singers who want to improve their audition skills. Training in this program is designed to help students achieve better outcomes at competitions and auditions for undergraduate programs. 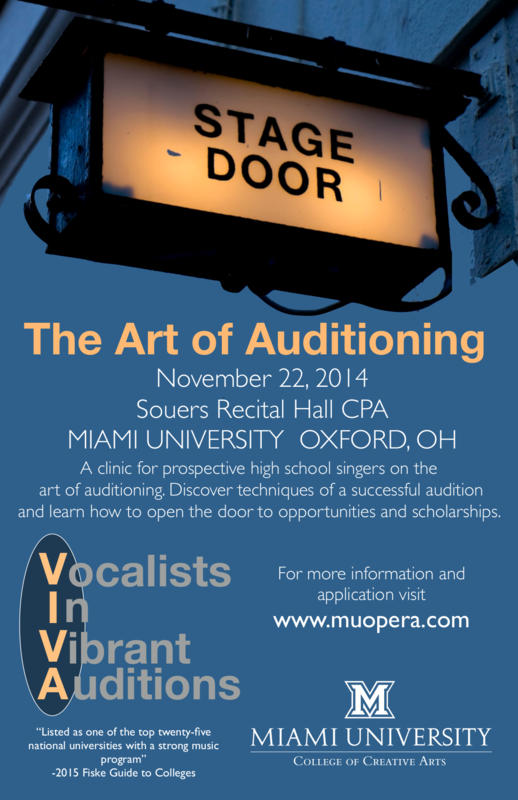 The workshop will be held from 9:30am to 4:00pm at Miami University in Oxford, OH on Saturday November 22nd, 2014. To attend Viva Miami! download and return the Application Form along with the $45.00 application fee. For more information on the workshop consult the Frequently Asked Questions or email Professor Alison Acord.